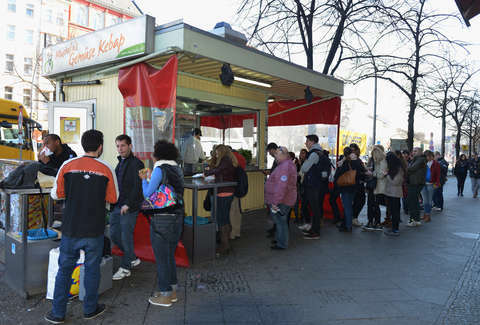 Let’s start with Berlin’s busiest kebab stand, where a pocket of Turkish delight costs only €2.90 (and up to an hour of waiting in line). Mustafa’s cult following includes tourists and locals alike for a few good reasons -- crispy chicken, fresh feta, and a secret ingredient we’re still trying to figure out. Consider queuing here at least once a rite of passage for most Berliners. K’UPS is hailed by a lot of locals as the smart alternative to Mustafa’s -- located conveniently on Kastanienallee with indoor seating and much shorter wait times. Kebabs come prepared by proper bread-meat-sauce ratio, and are available in the traditional choices of lamb or chicken and grilled veggies. Don’t let this grill house’s chain status fool you; it’s a local institution. In fact, the founder claimed to have invented the Berlin doner in his day (although there’s a couple guys who’ve said that). Hasir is one of the nicer, sit-down Turkish restaurants in the city, and besides doner, they also serve thick, delicious soups and grilled meats. A doner is nothing without its condiments, and the selection is usually limited to the holy trifecta of hot, garlic, and herb. That’s what makes NUR’s stand so wonderful, not only do they serve traditional sauces but also unconventional ones like curry, avocado, and yoghurt. Slathered onto high-grade chicken, the sauces are nothing short of a religious experience. 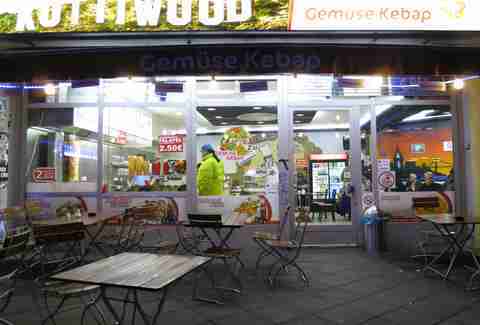 There are countless doner kebab joints around Kottbusser Tor, but Kottiwood is definitely a standout. Besides having a name that’s impossible to mispronounce, this place is known for a balanced doner full of chicken, grilled veggies, and cheese. Service is friendly, which deserves kudos considering the many patrons that surely end up here after spending a day at the bar. Also directly in front of Kotti, Tadim’s a kebab spot you’d likely get recommended by a local Turk. The flatbread is light, fresh, and homemade, nestling up the gratifying proportions of meat and fixings. The restaurant’s also well known for its Turkish pizzas, which are kind of like the doner’s skinny cousin -- minced doner meat on a thin bread, rolled up with all the regular condiments. 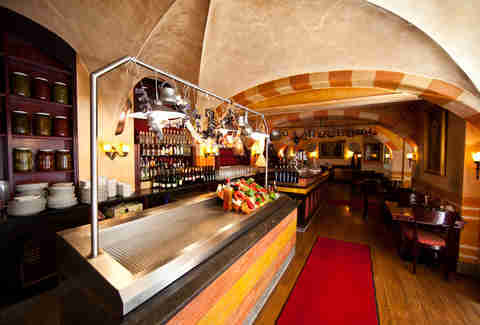 Imren Grill is another chain that does some of Berlin’s best (if not the best) doner meat. It’s marinated, seasoned, and packed onto the rotating skewer in-house (which surprisingly, isn’t as common as you’d think). Apparently, the secret is flavoring the beef with lamb fat, although there’s also a rumor that it’s tenderized in milk. Trust Berlin to have a vegan option for everything -- yes, even doner kebabs. Walk into Vöner, and you’ll still see a rotating kebab, albeit made of mixed seitan, veggies, and soy meal instead of meat. Despite this, doners come with classic trimmings like iceberg salad and tomatoes, and also not-so-classic side orders like vegan cheese fries. Barbara Woolsey is a Berlin-based writer whose boyfriend doesn't condone her choice of garlic sauce. Follow her gluttonous adventures on Facebook and Twitter.